Dimensions 1.25 by 6.50 by 5.50 in. Frankenstein, Victor (Fictitious character); Fiction. Frankenstein's monster (Fictitious character); Fiction. Amazon.com description: Product Description: Eager science student Victor Frankenstein uses body parts of the dead to bring a creature to life. Although initially excited that his experiment is a success, Frankenstein becomes horrified at the grotesque being that stands before him and flees. Angered by the rejection, The Monster retaliates by taking the lives of those dearest to Frankenstein. The decision to play God torments both Frankenstein and The Monster he created until the end of their days. About: Victor Frankenstein has always been fascinated by the darker side of nature One fateful night, his sinister obsession triggers a chain of events that will have terrible consequences for Frankenstein and those closest to him. About: One of the scariest and most gripping novels of all time is brought vividly to life in this graphic novel retelling created by renowned comic and graphic novel artist, Anthony Williams. About: Frankenstein de Mary Shelley (Mary Shelley's Frankenstein, en su título original en inglés) es una película de 1994 dirigida por Kenneth Branagh, protagonizada por Robert De Niro, Tom Hulce, Helena Bonham Carter y Kenneth Branagh. About: Frankenstein; or, The Modern Prometheus is a novel written by the British author Mary Shelley. About: Frankenstein; or, The Modern Prometheus is a novel written by the English author Mary Wollstonecraft Shelley that tells the story of a young science student Victor Frankenstein, who creates a grotesque but sentient creature in an unorthodox scientific experiment. About: Frankenstein; or, The Modern Prometheus, is a novel written by English author Mary Shelley about the young student of science Victor Frankenstein, who creates a grotesque but sentient creature in an unorthodox scientific experiment. About: Frankenstein; or, The Modern Prometheus, generally known as Frankenstein, is a novel written by the British author Mary Shelley. About: Frankenstein es una obra literaria de la escritora inglesa Mary Shelley. With Mary Wollstonecraft Shelley | from Createspace Independent Pub (June 14, 2015); titled "Frankenstein, or the Modern Prometheus"
About: Frankenstein By Mary Shelley. About: Heâs big, bad, and ugly, and he really wants a wife Frankensteinâs monster is on the rampage: terrorizing the locals, unleashing murderous hell . About: What you create can destroy you It was already one in the morning; the rain pattered dismally against the panes, and my candle was nearly burnt out, when, by the glimmer of the half-extinguished light, I saw the dull yellow eye of the creature open . About: Robert Walton, an explorer, describes his trip to the Arctic in letters to his sister, Margaret Saville, who lives in England. About: Frankenstein, or the Modern Prometheus Mary Wollstonecraft SHELLEY (1797 - 1851) Frankenstein begins in epistolary form, documenting the correspondence between Captain Robert Walton and his sister, Margaret Walton Saville. About: Frankenstein; or, The Modern Prometheus, is a novel written by English author Mary Shelley about eccentric scientist Victor Frankenstein, who creates a grotesque creature in an unorthodox scientific experiment. About: Frankenstein is a novel written by English author Mary Shelley about eccentric scientist Victor Frankenstein, who creates a grotesque creature in an unorthodox scientific experiment. About: Victor Frankenstein uses scientist to bring to life a man made of pieces of corpses. About: Frankenstein, is a novel written by the British author Mary Shelley. About: Classic gothic novel of Mary Shelley. About: Jugar a ser Dios es cosa fÃ¡cil, pero tiene, para todos los involucrados, creadores y criaturas por igual, un alto, altÃ­simo precio que entre todos pagamos tarde o temprano. About: Frankenstein spins a tale of young Victor who finds the recipe of bringing to life dead flesh, and tries to create a master race. About: The classic book, Frankenstein by Mary Shelley! About: Frankenstein is a novel written by English author Mary Shelley that tells the story of Victor Frankenstein, a young scientist who creates a grotesque but sapient creature in an unorthodox scientific experiment. About: Frankenstein, loved by many decades of readers and praised by eminent literary critics, is renowned for the sweeping force of its prose, the grotesque, surreal imagery, and the multilayered doppelgÃ¤nger themes of Mary Shelley's masterpiece. About: You already know the basics of the story--Doctor Victor Frankenstein creates a monster and brings it to life, and learns a powerful lesson that life is precious and should be respected. About: The idea for the story came to the author, Mary Shelley, in a dream she had about a scientist who had created life and was horrified by what he had made. About: ‘You must hear my tale. About: HarperCollins is proud to present its new range of best-loved, essential classics. With Mary Wollstonecraft Shelley | Student edition from Grand Central Pub (April 30, 2013); titled "Frankenstein: Or the Modern Prometheus"
About: Mary Shelley's classic tale, the story of Victor Frankenstein and the horror he unleashes when a scientific experiment goes catastrophically awry, has been a favorite on high school literature curricula for generations. About: Frankenstein; or, The Modern Prometheus is a novel written by Mary Shelley about an experiment that produces a monster. About: Mary Shelley's horror classic still has the power to chill nearly two centuries after it was first written. With Mary Wollstonecraft Shelley, Patrick Sandford (other contributor) | from Nick Hern Books (February 28, 2012); titled "Mary Shelley's Frankenstein"
About: All the more successful for staying faithful to the dark spirit of the original book, this adaptation includes notes on the first production and can be performed with a minimum of set and props, making it well suited for staging by schools and amateur theatre groups, as well as by professional companies. About: Frankenstein is the most successful Gothic novel in history and is also considered to be one of the earliest examples of science fiction. About: Victor Frankenstein was only trying to advance the cause of science. With Mary Wollstonecraft Shelley, Francisco Torres Oliver (other contributor) | Italian edition edition from Siruela (June 30, 2009); titled "Frankenstein o el moderno Prometeo / Frankenstein, or the Modern Prometheus"
About: La noche del 16 de junio de 1816, despuÃ©s de que Lord Byron y Percy B. About: Tells the tragic tale of Victor Frankenstein and the tortured creation he rejects is a classic fable about the pursuit of knowledge, the nature of beauty and the monstrosity inherent to man. About: Depicting the beauty of the written word, the handsome books in this series present an assortment of universal literature, from the drama of Shakespeare to the works of many well-known authors from the first half of the 20th century. About: Frankenstein is probably the most famous horror story in the world. About: The classic monster tale reanimated in a dynamic new format for today's reader. About: York Notes Advanced offer a fresh and accessible approach to English Literature. With Joel M. Berns | from Ballantine Books (January 1, 1994); titled "The Only Cholesterol Guide You'll Ever Need"
About: A guide to controlling cholesterol features ratings for more than one thousand food entries, recipes for low-cholesterol cooking, suggestions for lowering risk of heart disease, and a guide to controlling cholesterol intake while eating out. About: Eager science student Victor Frankenstein uses body parts of the dead to bring a creature to life. 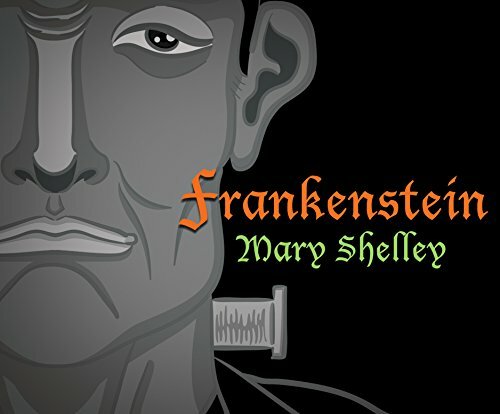 About: One of the greatest classic horror stories, Mary Shelley's Gothic novel sees Dr Frankenstein manufacture life - The Monster - only to see it go beyond his control.